Do you have a whole list of sewing projects you want to try this year? 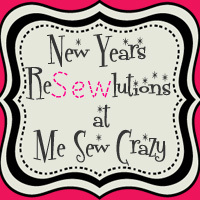 When Jessica from Me Sew Crazy asked if I'd be a part of her New Year's ReSEWlution series, I started to feel overwhelmed at all the things I'd like to attempt this year as far as sewing, techniques I want to try and projects I want to do. Then I started to panic about which one to choose to share. I thought, this is silly! What is it I really need to do to simplify? So, my reSEWlution is to focus on some projects I've already started (in the case of this coat, YEARS ago) to just finish them. I plan to toggle back and forth between the projects in my head and the ones sitting around, waiting to be hemmed or buttonholed. Hop on over there to see my post on how to decide what exactly to do with all those unfinished projects you've got hanging around. I'll BEE so interested to hear more about that. Cute coat! Your hair and your coat are equally adorable! I keep thinking I might actually finish the Christmas quilt I started ....years & years.... Ago. I want to learn some new techniques this year and copycat more patterns. I don't leave things undone usually so I don't have anything to finish. I want to get an early start on spring dresses this year. Do you have bees now? So exciting! Guess you are never coming up this way for awhile then, huh? 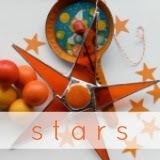 LeighAnn--I'm impressed you don't have any unfinished projects! Good job. It's a GREAT coat. You look beautiful! Love this coat. Is the pattern still in print? I've only recently subscribed to your blog. Today I am admiring your first picture. Most notable are the greens on the hives and buttons, and the blue in your eyes. Just a stunning picture! I am a total coat lover and that one is awesome Katy! Love the contrasting green buttons! You've got an eye girl! You look so pretty! Love the coat and the big green covered buttons. You've been a busy girl this week! So are these some of the beehives you hope to have some like one day or are they yours? Yay did you start your beehives?!? I certainly have plenty of unfinished projects! I need to make more time for sewing/crafting. There are loads of great websites and blogs which can help you get started and it's so satisfying when you finish your first project! Very cute coat! I enjoyed your post over there. And you have bees...! We started in as beekeepers last year and love it!